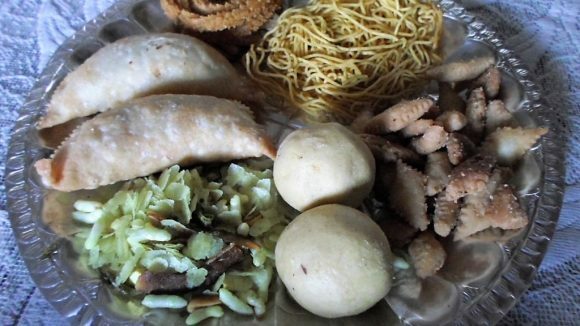 This is a Recipe for making at home tasty and nutritious Lal Bhoplyache or Red Pumpkin Paratha. 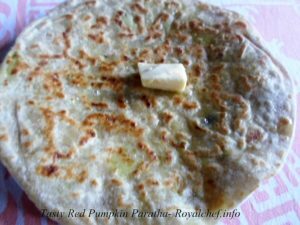 This Paratha, which is prepared using Red Pumpkin as the main ingredients can be served for breakfast, as part of the main course meals or in the tiffin boxes of school going children. Wash the Red Pumpkin, Ginger and shred it. Chop the Green Chili, Coriander Leaves. Take a medium size bowl and mix the Wheat Flour, Gram Flour, Red Pumpkin, Ginger, Red Chili Powder, Cumin-Coriander Seeds Powder, Turmeric Powder, Green Chilies, Sambar Powder, Coriander Leaves, Salt, hot Oil and add some Water to prepare a thick Dough. Keep the Dough aside for 20-30 Minutes. Prepare 8 equal size balls from the Dough. Roll the Dough into a Paratha size shape. Heat a nonstick Tawa and roast the Paratha from the both sides using Oil. Prepare the remaining Parathas using the same procedure.